“Synergy Health Bar” is a retail space, beverage lounge, and naturopathic spa and treatment space. Their concept statement is “Achieving body harmony through art and science”. It is a wellness clinic specializing in crystal energy therapy, with a focus on providing optimal health care with personalized energy and chakra treatment plans. 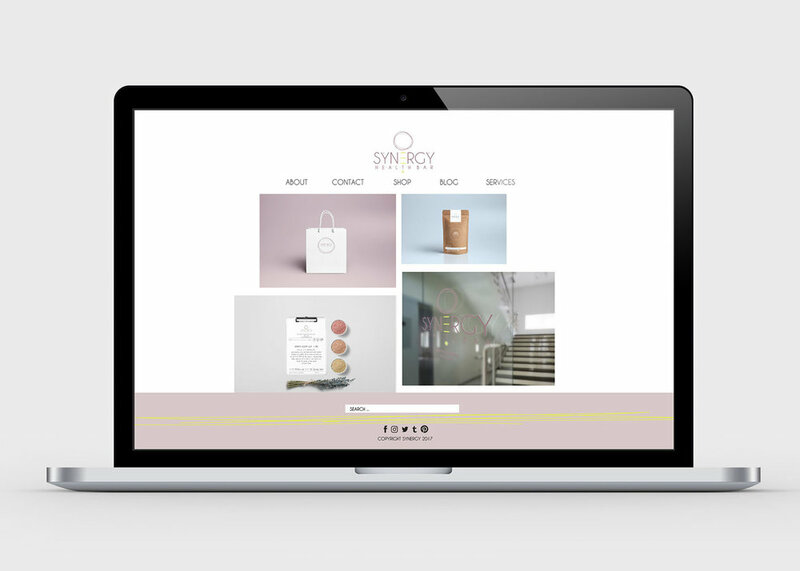 Synergy’s logo visually presents the idea of “synergy” — the interaction or cooperation of two or more organizations, substances, or other agents to produce a combined effect greater than the sum of their separate effects. An active circle is the main part of the logo which visually demonstrates this. Furthermore, dots are incorporated in the Y’s, creating the look of martini glasses and pushing the health “bar” idea. Their branding is based on their concept statement, and evokes this through the careful consideration of colour, shapes, and symmetry. In each branding application, sacred geometric elements relevant to corresponding chakra’s and medical uses are combined to reinforce the meaning behind each product.